Neuronal migration is a critical step in the construction of the nervous system. During fetal and early postnatal development, neurons migrate from the sites of their origin to their final destinations where they form neuronal architectures such as laminated structures and nuclei necessary for information processing in the nervous system. Because neuronal migration is a dynamic phenomenon, to gain insight into its mechanisms, it is of critical importance to monitor the migratory behaviour of neurons in a real time manner. In the past three decades, the combined use of time-lapse imaging systems with dissociated cell cultures, brain slices or microexplant preparations of brain tissues provided the experimental platform for examining the in vitro migration of neurons. 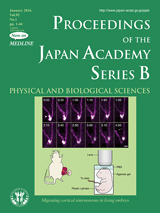 Although the use of these monitoring systems for the in vitro migration of neurons has demonstrated several aspects of migratory behaviours of neurons, including locomotion and translocation, branch-induced changes in migratory direction, multidirectional migration and random-walk-like behaviour, they do not maintain the natural cellular milieu (such as normal neuronal cytoarchitecture, cell-cell contact, daily fluctuations of hormone levels), which could play a vital role in controlling neuronal behaviour. 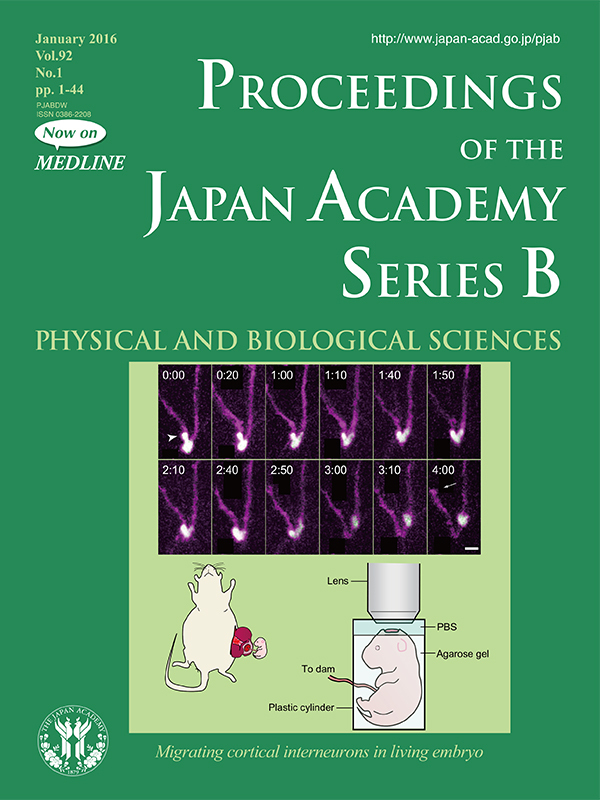 To overcome these problems, recently, Dr. Murakami and his colleagues developed a unique system for monitoring in vivo migration of cerebral neurons with the highest spatial and temporal resolutions. As summarized in this issue (pp. 1-19), using this new imaging system, Dr. Murakami and his colleagues for the first time succeeded in the observation of cortical interneuron migration in the brain of living mouse embryos, and analysed their behaviours in detail (Yanagida et al., PNAS, 2012). In experiments using the new monitoring system, cortical interneurons were fluorescently labeled by in utero electroporation, the embryos were removed from the uterus while keeping the umbilical cord attached and the migrating interneurons were imaged through the skull with a two photon microscope (schematically presented in the lower panel). The use of this new in vivo monitoring system uncovered sequential cellular events involving the alteration of the direction of neuronal migration and the modes of nucleokinesis. As presented in the upper panel, when neurons change the direction of migration, they do so by choosing one of the leading process branches. Interestingly, the translocation of the Golgi apparatus/centrosome into one of the leading process branches preceded that of the nucleus in most cases. Once the nucleus (white colored structure in the upper panel) entered one of the leading process branches completely, the neuron usually initiated migration in the direction of the extension of the leading process branch. Furthermore, migrating neurons exhibit two distinct modes of nucleokinesis: although nucleokinesis was often preceded by translocation of the Golgi apparatus, it also took place in parallel with the nucleus, implying occurrence of Golgi apparatus/centrosome-dependent and independent nucleokinesis. The new development of real-time monitoring systems for in vivo migration has already provided new insight into the role of the Golgi apparatus/centrosome complex in regulation of neuronal migration in the brain of living mouse embryos. This review article covers the most recent and comprehensive views of neuronal migration in the developing brain from the mode of migration, the selection of migratory pathway, and the termination of migration to the cellular and molecular mechanisms underlying each step of migratory events.